The Winter Olympics may be over, but the Special Olympics are just heating up -- and AUC students are actively coaching a team of participants. AUC began taking part in the Special Olympics in 2014, when the University hosted sports days and tournaments on campus. 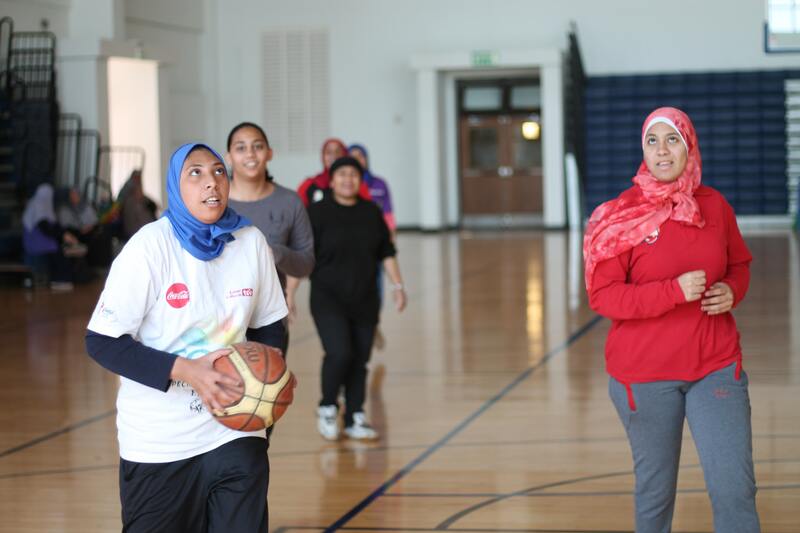 In the 2015 World Special Olympic Games in Los Angeles, Amira Ahmed, recreation and wellness manager in the Office of Athletics, was the women's basketball supervisor. This year, she was again nominated to travel with the basketball team for the Middle East North Africa (MENA) Special Olympics Regional Games, which run March 14 to the 23 in Abu Dhabi. Ahmed brought in AUC basketball captains Nada Gaser and Saif Abou Ali to coach the team, which consists of roughly seven 20 to 28 year olds who have been practicing twice a week in the AUC gymnasium. ​Hover over the photos for information about the players. PRACTICE STARTS WITH DRIBBLING DRILLS. engineering senior started coaching one year ago in the Basketball Academy, which is where he heard about Special Olympics Basketball. "I thought it was something good to do," Abouali said. "I've learned so much about teaching. From them, I've learned to be more patient. They're fun." ... BEFORE GETTING BACK TO BUSINESS. Though she likes to joke around on the court, Maha said she loves the rules of the game. THE ESSENTIALS: PASSING, SHOOTING FROM INSIDE, AND LAYUPS. PRACTICE ENDS WITH A SCRIMMAGE. The players argue over who will participate in the tip off, but eventually it's decided and the game begins. Mothers watch intensely from the bleachers, cheering their daughters on just as they will -- near or far -- as the team heads to Abu Dhabi. The women aren't sure what to expect as they head to Abu Dhabi, but are confident they'll be able to trump the competition. Follow the team, and others, at the Middle East North Africa (MENA) Special Olympics Regional Games here.